Dell's new Adamo is the company's most aesthetic laptop to date. But is this luxury notebook worth its $2,000 asking price? We compared it to its biggest rivals — Apple's MacBook Air and Voodoo's Envy 133 — to find out which machine offers the best value. Weight 4 lbs. 3.4 lbs. 3 lbs. Width (at thickest) 0.65" 0.70" 0.76"
While taste is largely subjective, the MacBook Air is undeniably the lightest laptop coming in at 0.3 lbs. under the Envy 133 and a full pound under the Adamo (pictured right). The Adamo, however, is the thinnest, measuring just 0.65" thick. Both the MacBook Air and the Adamo are made from a single piece of aluminum, the former featuring Apple's unibody design, while the latter uses Dell's unibody enclosure and comes in either an etched (Pearl) or brushed (Onyx) finish. Voodoo, however, took a different approach in designing their laptop and constructed the Envy 133 out of carbon fiber, which is sturdier than aluminum, but more expensive and prone to withholding heat. The Envy also features a layer of protective gloss coating, which gives it a shiny finish, but also makes it susceptible to fingerprints and smudges. While both aluminum and carbon fiber have their pros and cons, in the end, the MacBook Air wins the weight battle while the Dell Adamo has the thinnest profile. Despite their sizes, both Dell and Voodoo packed their laptops with plenty of features and connections. Dell's Adamo, for instance, sports the best screen with a 1366x768 resolution. It's also the only laptop to include a 128MB solid state drive — by comparison, Apple charges an extra $500 for the 128GB SSD, whereas Voodoo charges $500 for their 64GB SSD. However, by including the SSD in the baseline model, the entry-level price of the Adamo is locked in at $1,999. Nevertheless, like the Voodoo Envy, it offers sufficient USB ports and an Ethernet port. The MacBook Air, however, remains hindered by its sole USB port. While none of the laptops include a DVD burner, Voodoo bundles an external dual layer DVD burner with its Envy 133. In addition, the laptop features an HDMI port — a rarity amongst ultraportables — which makes the system easy to connect to any flat-panel HDTV. Although larger than average, the notebook's power brick doubles as a wireless access point with a built-in Ethernet port. Like the MacBook Air, the Envy's touchpad also supports multitouch, pinch, and momentum gestures. Other features include Voodoo Proximity, which temporarily disables the touchpad when both hands are on the laptop's palm rests and Voodoo's Instant Operating System, a Linux-based alter ego that lets you boot up instantly and use FireFox, Skype, or any DVD or music program without having to wait for Windows Vista to launch. Ultraportables are notorious for being underpowered, and while none of these systems have the power to run with a mid-size notebook, the Macbook Air offers the biggest punch by bundling the fastest RAM, a 1066MHz front side bus, and the best integrated graphics. By comparison, the Adamo packs a slower 1.2GHz CPU with an 800MHz FSB, while the Envy 133 features the same FSB as the Adamo and slower DDR2 667MHz RAM. When it comes to productivity software, the Macbook Air is unbeatable. It includes iLife '09, which features iPhoto, iMovie, GarageBand, iDVD, and iWeb. Meanwhile, the Envy 133 features CyberLink DVD Suite Deluxe and AVG Professional. Packing the least coveted software suite is the Dell Adamo, which includes Roxio Creator DE, PowerDVD 8, and a 30-day McAfee Security Center trial. 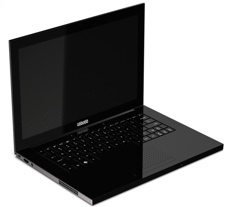 Although the Adamo boasts the longest-rated battery life, the Voodoo Envy 133 is the only laptop of the three with a user replaceable battery. So depending on your needs, you'll want to decide what's more important — being able to carry a spare battery or having the longest battery life. Despite being renown for its premium prices, of these three ultraportables, Apple's MacBook Air offers the better value and the lowest price. It's severely limited by its one USB port and it doesn't offer the best display, but otherwise Apple hit the mark on every aspect of its 2nd-generation MacBook Air. Design-wise, the Adamo catapults Dell into a new direction where it can compete with stylish laptops like the MacBook Air and Envy 133. Unfortunately, Dell failed to deliver a truly groundbreaking product and instead left us with an overpriced and underpowered ultraportable. As a result, the 2nd-generation MacBook Air has proven it is the ultimate ultraportable, beating both the boutique laptop manufacturer, Voodoo, and the new Dell. Louis Ramirez is dealnews' Features editor.